Astronomy Associates of Lawrence (AAL) is an organization of people with a common interest in astronomy. Participation in AAL is not limited to people in Lawrence, it is open to everyone! During the school year (August through April), AAL will usually meet on the LAST SUNDAY of each month to take care of club business, discuss upcoming events, and hold presentations related to astronomy. (Changes are occasionally made to allow for special events and to avoid holidays, e.g. Thanksgiving weekend). Everyone is invited to attend these meetings. 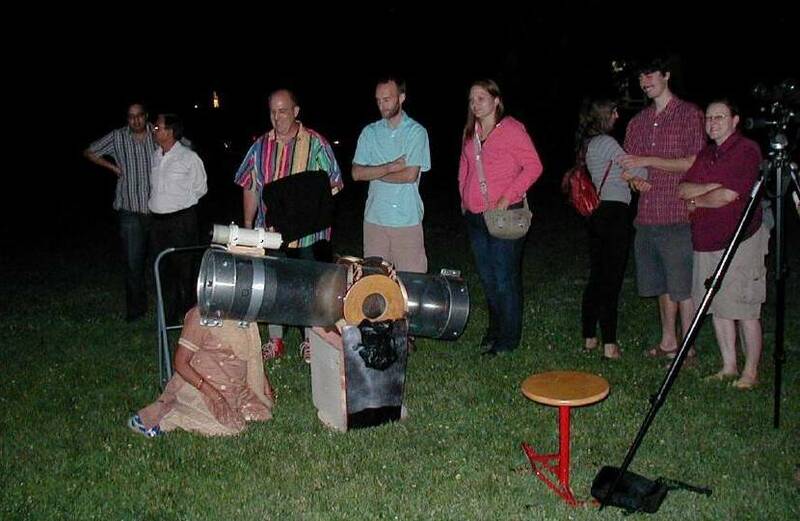 We will also meet on the last Sunday of each month, weather permitting, for a Public Observing Session. These sessions will be held at the Baker Wetlands Discovery Center south of Lawrence. The Public Observing sessions will begin the last Sunday in August; the sessions are scheduled to start after twilight. See the Events page for more info. The AAL meetings will begin at 7PM at the Discovery Center and finish in time to allow attendees to take part in the public observing. For the summer, AAL runs public observing sessions after the Lawrence Band Concerts every other Wednesday evening. The sessions take place in South Park, west of Mass St. and begin between 9 PM and 9:30 PM, as always, weather permitting. For more details, check out the Events page . 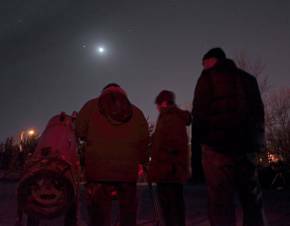 Check the Events page to (a) discover special astronomical events of interest, (b) find out what's visible in the sky this week, and (c) confirm the meeting dates and Public Observing Sessions. The dates are periodically altered to account for holidays and special events. This page also contains maps and driving directions, and information on other activities and upcoming events that will be hosted by AAL. 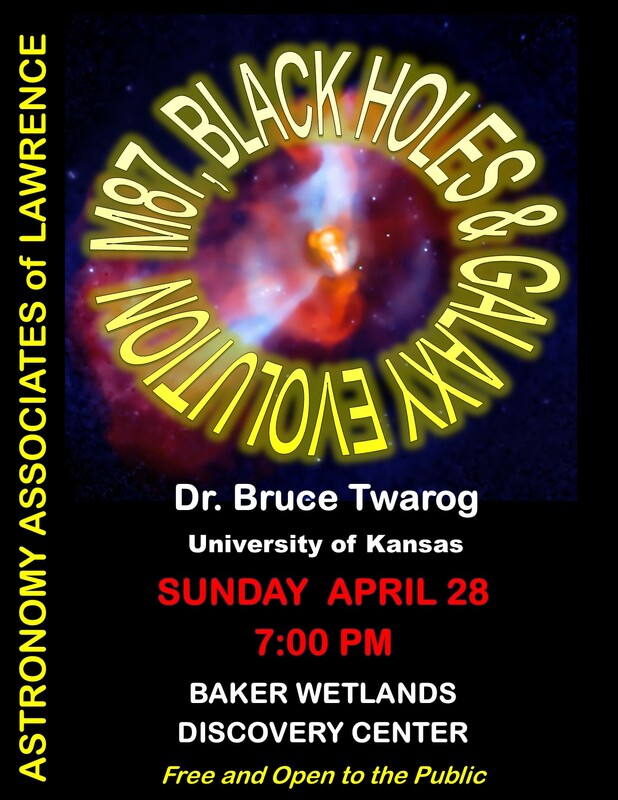 Astronomy Associates of Lawrence is a club for anyone interested in the wonders of our universe. Everyone is encouraged to get involved and join AAL! AAL is affiliated with two national organizations for amateur astronomy, the ASTRONOMICAL LEAGUE, headquartered in Kansas City, and the NIGHT SKY NETWORK, run through NASA. Links to both organizations are accessible below. An extended set of links to a variety of astronomical organizations, observatories, and astronomy news can be accessed at WEBSITES link in the left menu column. Thank you for your time and interest. We wish you clear skies and happy stargazing! Click the color bar above for a complete, hourly forecast and chart information for the Lawrence area for the next ~48 hours.